Before your home buyer's dream home can become a reality, your basements must be built with the same quality construction standards you use throughout your homes. These easy-to-understand drawings provide some of the construction techniques you need to make your home buyer's dreams come true. This is not meant to be a complete construction manual. Rather, it is a general checklist of good basement construction practices to help ensure the quality of your new homes. The most effective line of defense against basement wall moisture problems is TUFF-N-DRI Basement Waterproofing System from Tremco Barrier Solutions. Consult your Tremco Barrier Solutions Contractor for recommendations and local code requirements. Exterior insulation offers many advantages to you and your home buyers. Exterior insulation protects the will and waterproofing membrane from the extremes of the soil and above grade climate. 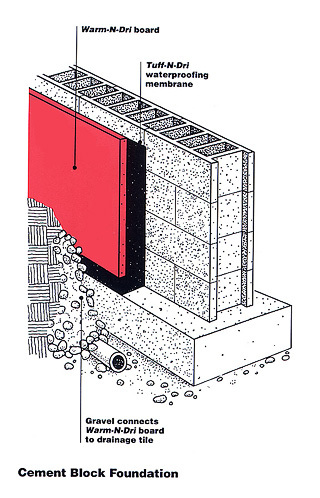 The wall maintains a stable temperature and undergoes little thermally induced expansion and contraction. This reduces the potential for cracking. 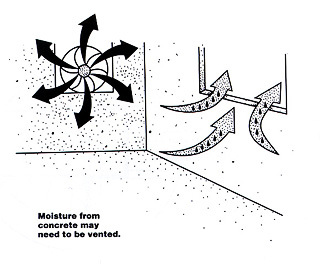 Since the wall's temperature is maintained nearer to the indoor temperature, humid interior air is unlikely to condense on the basement walls. 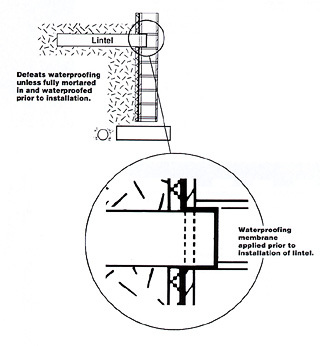 Install a perimeter footing drainage system to relieve hydrostatic pressure from surface water and table water. An exterior, versus an interior system, is preferred. However, many experts recommend both forms of drainage. When using both, the exterior system is used as the primary drainage system while the interior is used as a backup and for venting the soil of gases. 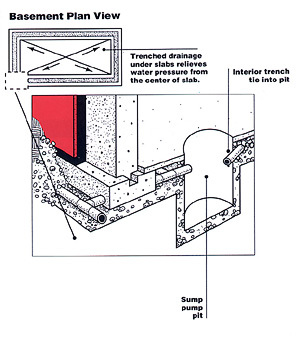 The drainage system should connect to a sump pump or go to daylight for a gravity discharge. For most residential applications, a 4-inch diameter perforated drainpipe is adequate. The top of the pipe should be below the level of the underside of the basement floor slab and should be completely surrounded by gravel on all sides. Also, make sure the Warm-N-Dri board is connected to the drainage. system by gravel, by weep holes, or by pipe through the footer to an interior drain. Check your local codes for minimum requirements. Then, plan to exceed them to be safe. A clean-out point make drainage system maintenance easy. A solid PVC pipe connected to the exterior drainage system and extending to the grade level provides a path to clear the drain tile. For the interior system, the pipe extends to the slab. In both cases, the clean-out point should be at the furthest distance from the discharge. Also, the clean-out pipe should be sealed with a water tight cap. As the shape of the basement becomes more complex, the number of clean-out points should increase. 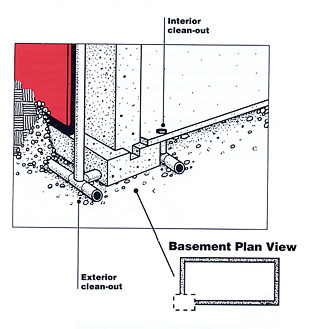 As basements become larger, the slab will be more susceptible to pressure from the water table. It is important to have a minimum 4 -inch layer of clean gravel spread evenly under the slab area for drainage. There should also be a pathway to relieve water pressure from the center of the slab. This can be done by digging a 6 to 8 - inch deep trench in an X pattern, filling it with clean gravel and connecting it to the drainage system. As the water table rises, the pressure is relieved through the pathways and then into the sump pump or daylight drainage system. Remember that the top of the perimeter exterior drain tile should be below the bottom surface of the interior slab. Open brick ledges provide a pathway for water to travel down the basement wall and are a potential source for basement wall leaks. All brick ledges should be sealed and waterproofed. 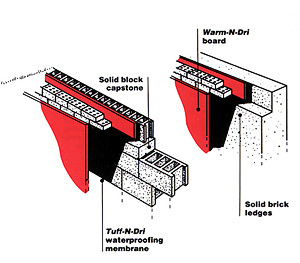 In addition, for block construction, a solid capstone should be used to seal the brick ledges before waterproofing. After the utilities, drainage tile and the Tuff-N-Dri Waterproofing System have been installed, backfilling begins. 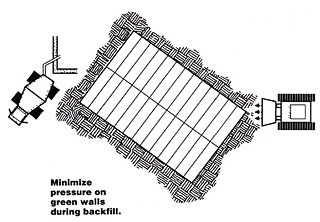 Early backfilling against green (non-cured) concrete or block exerts great pressure on foundation walls and is one of the causes of structural cracking and failure. Delay backfilling until concrete has gained strength. Consult your mason or poured wall subcontractor regarding the strength of the foundation walls over time and coordinate with the backfilling crew. When backfilling around the foundation walls, start slowly at the corners to evenly distribute soil pressures. Then fill the sides. 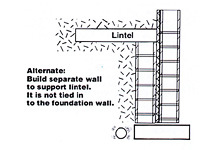 Do not backfill until the top to the walls have adequate lateral support. Different methods of providing support can be used including diagonal bracing, floor joists cast into the top to the wall and floor joists attached on top of the wall with anchor bolts. Do not drive heavy equipment parallel to, or at right angles to the walls, before the walls have had sufficient time to cure. This can exert extra pressure and force structural cracks. There are approximately 400 gallons of water in the cement necessary to build the walls of an average-sized poured wall basement. Also, the slab contains approximately 200 gallons of water. Most of the water will escape in the first 3 to 12 months, depending upon weather conditions and whether or not the basement is left open. If the basement is not allowed to dry out by circulating air or running a dehumidifier 1 to 2 months after completion, the water used in the construction can cause high humidity. The high humidity can lead to mildew. The long term solution to condensation on the basement walls is the Warm-N-Dri insulation board. By insulating the outside of the foundation walls, the wall temperature will tend to be closer to the air temperature of the basement. This reduces condensation problems on the basement walls. The rods in poured walls should be broken off inside and outside the foundation walls. All penetrations (including water, sewer and electrical lines through the wall) should be made before the installation of waterproofing. Many subcontractors do not seal these penetrations with materials which will stop water. If these penetrations are made after the installation of waterproofing, inspect your basement walls to be sure that these areas are sealed before you continue with construction. Your local Tremco Barrier Solutions Contractor can help you determine whether or not these penetrations are sealed properly. Landscaping is a simple and inexpensive way to help stop water from penetrating the unprotected areas above grade. It also helps prevent ponding against the above grade walls where there may not be any waterproofing. The ground surface around your homes should slope downward and away from the wall at least 5% (about 6 inches) over the first 10 feet surrounding the basement wall. This will direct surface runoff away from the home. 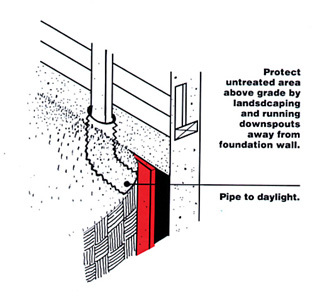 You might also consider waterproofing the above grade wall area with the Tuff-N-Dri Waterproofing System. The Warm-N-Dri insulation board will provide exterior insulation. The board will need a protective coating to prevent abuse. Cementation and stucco finishes are often used. Consult your local Tremco Barrier Solutions Contractor for appropriate coatings for your homes. Landscaping The geological characteristics of your area are the most important factors in determining whether or not you have a radon gas problem. Check with your state Environmental Protection Agency (EPA) office to help determine the likelihood of a potential radon problem. The following recommendation for venting radon is commonly accepted and can be installed at the time of construction for a very low cost. To ventilate radon, passively vent the soil and gravel beneath the basement slab via a PVC pipe to the outside through the roof. Then, if needed, and a fan in the PVC pipe at the attic level to pull the radon through. 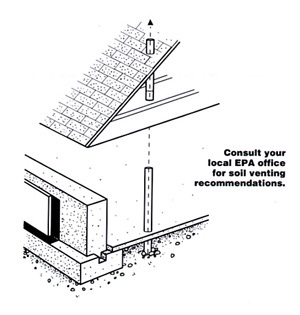 For specific recommendations, consult your state EPA office or your local building authorities. The addition of porches, patios, crawl spaces, after the waterproofing is installed requires some care. Do not allow porches and stoops to crush and block the drainage system. 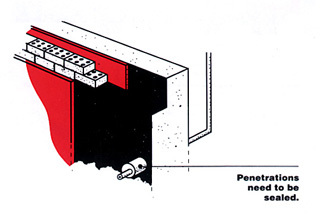 Do not allow lintels or patios to be installed by penetrating the waterproofing. Arrange to have Tuff-N-Dri membrane applied prior to installation of lintel. Your local Tremco Barrier Solutions Contractor should be involved in the planning and construction of lintel tie in to ensure that all exposed wall space is thoroughly sealed to prevent water seepage. Patios, porches, stoops, and driveways should slope away from the foundation. If not, water can pool and enter in the unprotected areas above or around the waterproofing.